Pure Twilight DAB radio aims to brighten your mood | What Hi-Fi? Its new Pure Twilight (£130) is a DAB/FM bedside radio with built-in dawn simulator, said to be the most energy efficient product of its kind on the market. 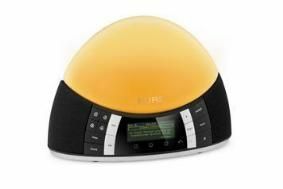 Pure says the Twilight delivers "the ultimate bedside experience" (no sniggering at the back please), and "offers dawn simulation, mood lighting, built-in natural sounds and lullabies as well as a reading light and four independent alarms". Oh, and it plays the radio too. It energy-saving LED-based light provides the same output as a 45W incandescent light for just 5.4W. The user can be woken by one of four alarms: an electronic tone, digital radio, FM radio or special alarm sounds including a church bell, cockerel, wind chimes, dawn chorus and cicadas. All of these alarms can be accompanied by dawn simulation with a light that increases gradually to mimic the rising of the sun, helping to overcome seasonal affective disoorder (SAD), claims Pure. Mood lighting settings include Fire (red and orange), Ocean (blue through cyan to green), Wheat Field (gold and green) and Party (flashing disco colours). What's more, Twilight can even send babies or young children to sleep to the sound of Twinkle, Twinkle, Little Star, Rock-a-Bye Baby, or Brahm's Lullaby. There's also a USB PowerPort for connecting USB accessories such as a mobile phone charger or small fan, and an aux input for connecting an iPod or MP3 player.